I HAD TO GET MY FAN OUT THIS WEEKEND. BECAUSE IT IS KIND OF HOT. – Hello? I Forgot My Mantra. I HAD TO GET MY FAN OUT THIS WEEKEND. BECAUSE IT IS KIND OF HOT. Published on May 11, 2015 May 11, 2015 by i forgot my mantra. My weekend was pretty quiet in a good way. I was incredibly annoyed by work on Saturday and thus, very cranky. Luckily, my mother was kind enough to listen to me rant for a bit on the phone. On Sunday, I got up and ran a 4 mile race in Central Park (Japan Day!) which was harder than it should have been. I returned home to my loveseat and spent the rest of the day there. I then met my friend Jenny for some little league viewing in Battery Park City. 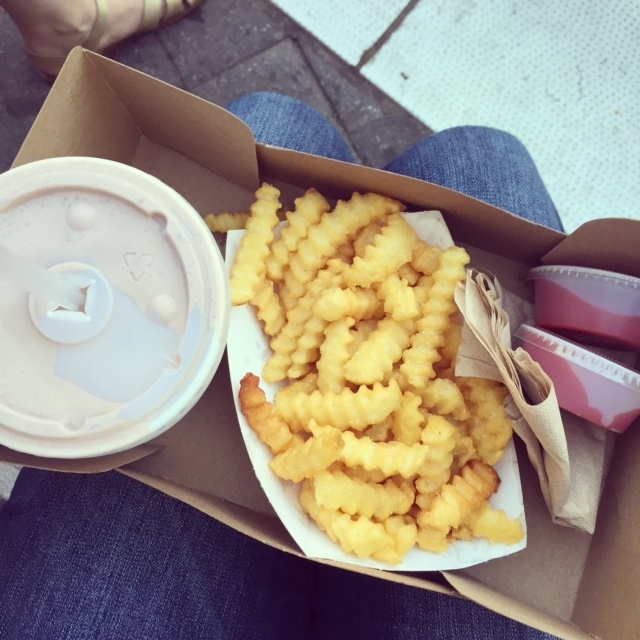 We had milkshakes and fries. And there was a cool breeze blowing. AND, I realized I forgot to this and that on Friday, so enjoy on a Monday! –People are the worst. Especially on tumblr. –I hate myself for caring about the Royal Baby…and yet, I like this slideshow. So. –Two Buzzfeeds in one post, I know. But yummo. Categories Why can't I take my sweater off??? Previous IT’S A ‘REAL FEEL’ OF 85 OUTSIDE. P.S. That wine ice cream etc looks delish!